A fun-to-play-with chopper with two propellers that turn and a big 3" diameter front cockpit. All patterns drawn FULL SIZE. Measures 7-1/2"L. Make it from your scrap wood and our hardware package available separately or see Special below. 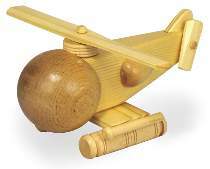 Helicopter Hardware includes one 3" wood ball, two half eggs, four milk drums, one 5/8"L axle peg, one 1-1/8" axle peg, two 2-3/8"L axle pegs and one 1-1/4" grooved wheel. Project plan, remaining wood and wood finish not included. Helicopter Special includes W3022 Helicopter Plan and one No.2036 Helicopter Hardware Package.